Having just returned from my travels to the Greek Islands back to NYC, I was thinking of how much I love the food of the Mediterranean. I went down memory lane got thinking about some of the amazing food I had tasted in Morocco years ago. 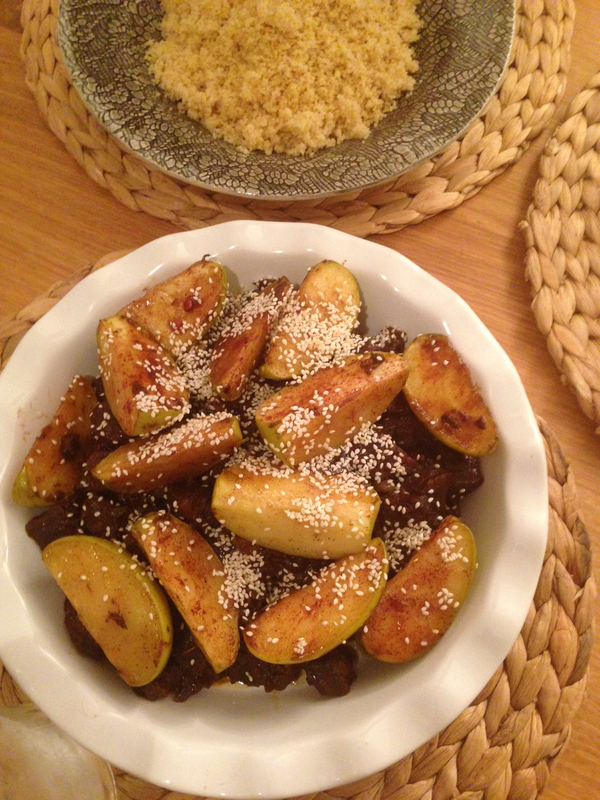 Dang, I knew now what I had to have for dinner… a delectable slow cooked melt in your mouth tender beef tajine. I really recommend using a lush thick thyme honey for this dish, which if you taste, you too will fall in love with as I did in Greece recently. I now love it on everything including my yogurt with some walnuts(greek style)! Once you have the meat simmering away, you can easily leave it on the hob on the lowest heat to bubble away as you potter around the house doing other work. It will need your love and attention again towards the end with the apples and putting it together. I would make sure the meat has a little sauce as you don’t want it to be too dry with the couscous, just add a little water if its getting too dry to get it to the right consistency near the end. Place a heavy based saucepan over high heat, add 1 tablespoon of oil and 20 grams of butter and brown the beef in batches. Place the browned meat in another dish. Add the remaining oil as needed to brown meat. Reduce the heat to medium and add the onions. Cook gently for 5 minutes till onions are softened. Sprinkle in the saffron, ginger and cinnamon and cook for a minute or so. Add 1 1/2 cups of water, 1 1/2 teaspoon salt and a generous grind of black pepper. Stir well and return the beef to the pan, along with the coriander sprigs tied together. Cover and simmer over low heat for 1 1/2 hours. Add the raisins and 1 tablespoon of the honey, then cover and simmer for a further 30 minutes, or until the meat is tender. Meanwhile, wash the apples, halve and remove the cores. Cut each half into three wedges. Heat the remaining butter in a frying pan and add the apples. Cook for 10 minutes, turning the apples frequently. Drizzle with the remaining honey, dust with the extra cinnamon and cook for 5 minutes or till they look softened and glazed. Transfer the meat to a serving dish, pour the sauce over and arrange the apples on top. Serve hot, sprinkled with the toasted sesame seeds. Devour with some couscous and perhaps a salad.